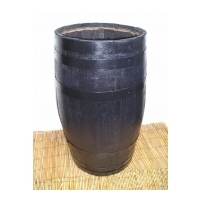 Small oak barrel planters consist of a small open-ended barrel. Coopered from oak staves that have been recycled from larger barrels, these intriguing planters each have their own individual charm and the durability afforded by oak. Please note that these barrels are not watertight. Our strawberry barrel planters have holes around their surface, which provide additional planting area. They are ideal for planting strawberries or alternatively may be planted with other trailing plants which, when in flower create a ball of colour. 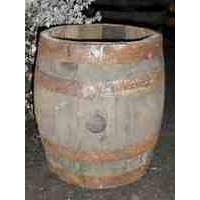 Small barrel shaped planter based on a firkin barrel. Approximate height 18" (45cm), approximate diameter 16" (40cm). These Firkin Oak Barrel Planters are available in two finishes, a natural finish and a dark stained finish. Barrel shaped planter based on a kilderkin barrel. Approximate height 24" (60cm), approximate diameter 18" (45cm). 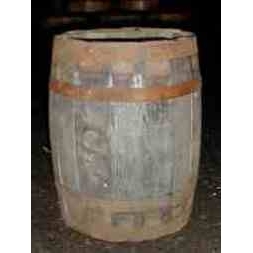 These Kilderkin Oak Barrel Planters are available in two finishes, a natural finish and a dark stained finish. 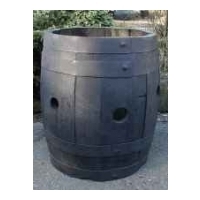 Tall barrel shaped planter. Approximate height 35" (87cm), approximate diameter 18" (45cm). 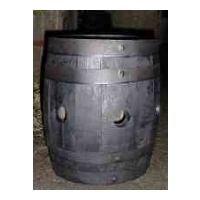 These Tall barrel Oak Barrel Planters are available in two finishes, a natural finish and a dark stained finish.